We'll gladly provide recent references for interested pastors and Bible teachers to contact! Additionally, you are welcome to receive our periodic e-letter. Book studies are designed for personal or group use. Some include workbooks and audio. Our book studies are being downloaded in the United States and around the world. They represent a work in progress and are constantly being updated.. Some still need a bit of editing and a few need to have a few more pages inserted. Some have audio and presentation files associated with them. The computer versions are entirely free for your use! Biblical Intensives serve a two fold purpose. They ground the listener is relevant biblical truth while improving his personal Bible study skills. We minister to all sizes of groups and congregation and we never make financial demands of any kind. We focus on the West and Midwest, but can easily arrange out of area conferences. Intensives are typically presented in four to six sessions and are adjusted (on the fly) to the learning levels of your group. 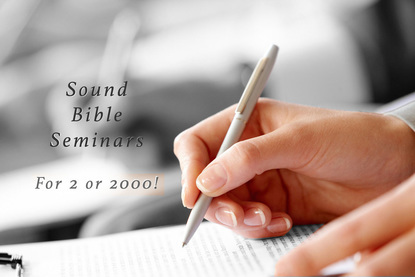 The intensives are geared for mixed audiences • most include slide presentations • listeners learn good habits of Bible interpretation • supplements are provided • we NEVER solicit bookings • intensives are not limited to local church sponsorship but we do limit our church outreach to biblically fundamental fellowships • free will offerings are welcomed but not required • we are a 501c3 faith ministry. Click here to learn more about Jim and Anne Steel, their ministries, and how to support their work for the Lord Jesus!